Some trees get no respect; they provide shade, produce beautiful flowers, and fit nicely into the landscape, but nobody knows them. 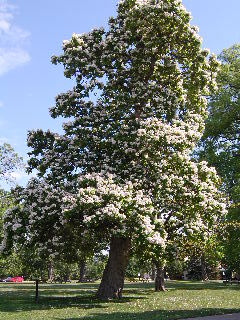 Meet the Catalpa speciosa. Have you ever heard of this tree? Don’t be ashamed to admit it if you haven’t; that just makes you part of the vast majority of people, some professional landscapers among them, who have no idea this species exists. Let’s take a look at this unassuming, mostly anonymous, hard-working beauty. The Catalpa speciosa is ideal for adding to your landscape if you’re looking for a fast growing shade tree. It produces large (10 to 12 inches long and 7 to 8 inches wide) leaves that are dark green, heart-shaped, and deciduous in nature. In the springtime, after these leaves appear, the tree puts on a real show by presenting a beautiful display of clusters of white flowers that are marked inside the blooms with patterns of purple and yellow. Each individual flower is quite large, usually about 2 to 3 inches across. As the tree grows to heights of 100 feet or more and develops its beautiful broad, rounded crown, its appearance on the landscape as it reaches upward is that of a striking showpiece specimen planting. The tree is adaptable to a variety of soils and sites and is widely planted throughout the United States, having been naturalized to all but the very coldest regions of the country. The Catalpa tree develops a taproot, allowing it to dig deeply into the soil for moisture and nutrients, and enabling it to withstand extended periods of heat and drought. So, with an impressive resume like this, why isn’t this guy famous? 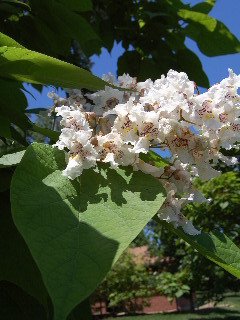 Sadly enough, it’s because the Catalpa speciosa is thought of mostly as a weed tree, a quick-growing variety added temporarily to the landscape to provide fast shade, much like the silver maple. It doesn’t have the reputation for long-term growth and beauty of species like the red maple, sugar maple, or many of the oaks that are added into the landscape plan for their elegance. Do this tree a favor; put it on your team, send it into the game, be bold and add the Catalpa speciosa tree to your landscape plan! That is, if you can find one. Inquire at your local garden centers to see if they ever get Catalpa speciosa trees in, or any of the other varieties of Catalpa trees, for that matter. If they don’t, see if they are familiar with them and ask if they would be able to order some to offer for sale. Give the Catalpa speciosa tree a break and show it some respect; the rewards are great.